Objective: SAR1B, apoB and MTTP were involved in lipid metabolism, which is important for the development of ICAS. This study aimed to investigate the expression of SAR1B, apoB and MTTP in patients with intracranial atherosclerotic stenosis (ICAS) and the clinical significance. Methods: Eighty patients with acute ischemic stroke were selected in our hospital from Jan 2016-Jun 2016. According to the results of imaging examinations and other clinical data, patients were divided into ICAS group (n=32), Extracranial Atherosclerotic Stenosis (ECAS) group (n=20) and No Atherosclerotic Stenosis (NCAS) group (n=28). LDL-C and HDL-C levels were detected by selective inhibition method and immunization inhibits method respectively, level of ApoB was determined by immunofluorescence, levels of SAR1B and MTTP were detected by Enzyme-Linked Immunosorbent Assay (ELISA). Results: Compared with NCAS group, LDL-C level was increased and HDL-C level was decreased in ICAS group, while no significant difference were found between ECAS and NCAS groups; apoB and SAR1B levels were higher in ICAS group than in NCAS group, no significant differences were found between ECAS and NCAS groups, in addition, there were no significant differences in MTTP level between groups; serum SAR1B and apoB levels were positively correlated with the level of serum LDLC level; SAR1B and apoB levels were positively correlated with the MRA diagnostic score of patients with ICAS. Conclusion: Expression levels of SAR1B and apoB were specifically increased in ICAS patients, so the increased expression levels of SAR1B and apoB can be used as biomarkers for diagnosis of ICAS. Intracranial atherosclerotic stenosis (ICAS), Extracranial atherosclerotic stenosis (ECAS), No atherosclerotic stenosis (NCAS), SAR1 gene homolog B (SAR1B), Apolipoprotein B (ApoB), Microsomal triglyceride transfer protein (MTTP). Atherosclerosis, which is also known as arteriosclerotic vascular disease, is a specific type of arteriosclerosis. Atherosclerosis is characterized by the thickened artery wall caused by the white blood cells invasion and accumulation, in addition, atheromatous (fibrofatty) plaque created by the proliferation of intimal-smooth-muscle cells is also a main cause of atherosclerosis . It has been shown that, among atherosclerosis, Intracranial Atherosclerotic Stenosis (ICAS) is more prevalent in Asians, while Extracranial Atherosclerotic Stenosis (ECAS) is more common in Caucasians . ICAS, as one of the most common causes of the onset, development, and recurrence of ischemic stroke, is proved to be positively correlated the risk for recurrent stroke and progressive dementia [3,4]. It has been reported that ICAS is responsible for about 10% of strokes in North America and 30%-50% of strokes in Asia . Up to now, the mechanism of ICAS induced stroke is still not well understood due to the difficulties in collecting ICAS specimens from living patients . Therefore, the early diagnosis and treatment of ICAS is the key in preventing stroke caused by ICAS. A variety of biomarkers, including PAI-1 and hsCRP, have been widely used in detecting ICAS . However, the clinical applications of those biomarkers are still challenged by the varied individual response. Therefore, it would be of great clinical value to identify new biomarkers to improve the early diagnosis and treatment of ICAS. Abnormal lipid metabolism plays pivotal roles in the development of ICAS . It has been reported that the lowdensity lipoprotein (LDL) is closely associated with the development of atherosclerosis, and increased level of LDL can be used as a diagnostic and prognostic marker of atherosclerosis . In addition, high-density lipoprotein [HDL], which is a protective factor against coronary heart disease, was also found to be correlated with the progression of ICAS , and the level of HDL is usually reduced in patients with ICAS . Apolipoprotein B (apoB), as a major component of Low Density Lipoprotein (LDL), can regulate LDL level by affecting lipid metabolism . It has shown that increased apoB level is closely related to the occurrence of ICAS . Microsomal Triglyceride Transfer Protein (MTTP) is essential for the assembling and secretion of LDL and reduced MTTP level can usually lead to reduced level of LDL [13,14]. SAR1 gene homolog B (SAR1B), which is responsible for protein translocation from endoplasmic reticulum to Golgi apparatus, play pivotal roles in the formation and secretion of chylomicrons, and metabolic residue chylomicrons is closely related to the occurrence and development of atherosclerosis . In view of the functionality of apoB, MTTP and SAR1B, it will be reasonable to hypothesize that they may have important functions in the progression of ICAS. In this study, expression patterns of SAR1B, apoB and MTTP in patients with ICAS were investigated and the correlations with low-density lipoprotein cholesterol LDL-C level were analysed. In addition, the possibility of SAR1B and apoB as biomarkers for the diagnosis of ICAS was also discussed. Eighty patients with acute ischemic stroke were selected in our hospital from Jan 2016 to Jun 2016. Exclusion criteria: (1) Patients with cardiogenic stroke or stroke caused by other causes or unexplained causes; (2) Patients with a history of systemic disease, including cancer, collagenosis, metabolic diseases (diabetes was not included); (3) Patients with incomplete clinical data. They were: (1) Intracranial Atherosclerotic Stenosis (ICAS) group, patients with symptomatic or asymptomatic intracranial arterial stenosis ≥ 50%, intracranial arteries included siphon of bilateral internal carotid artery, middle cerebral artery, anterior cerebral artery, posterior cerebral artery, intracranial branch of vertebral artery and basilar artery, n=32; (2) Extracranial Atherosclerotic Stenosis (ECAS) group, symptomatic or asymptomatic extracranial extrahepatic stenosis ≥ 50%, extracranial artery included common carotid artery, extracranial carotid artery, innominate artery, subclavian artery and extracranial vertebral artery, n=20; (3) No Atherosclerotic Stenosis (NCAS) group, patients with intracranial and extracranial atherosclerotic stenosis <50%, n=28. This study was approved by the ethics committee of our hospital. All the patients signed informed consent. All the operations were performed in strict accordance with ‘Declaration of Helsinki’. Fasting elbow venous blood (3 ml) was extracted from each participant. Blood samples were subjected to centrifugation (3000r) at 4°C to separate serum. Serum samples were stored at -70°C before use. LDL-C and HDL-C were detected by selective inhibition method and immunization inhibits method respectively using OLYMPUS AU5400 automatic biochemical analyser. Reagents, standard and quality control were provided by DiaSys (Shanghai, China). The level of apoB was determined by immunofluorescence (Dade Behring, BN II analyser). Intraindividual coefficient of variation (CV) of apob is 2.8%. SAR1B and MTTP were detected using EH12070 and EH1282 ELISA kits (FineTest, Wuhan, China) respectively according to the instructions of kit. Detection ranges of SAR1B and MTTP were 0.156-10 ng/ml and 0.312-20 ng/ml, respectively. Standard wells and blank wells were set on ELISA plate. Serum sample were diluted 5 times and added into plate with 50 μL per well, followed by incubation at 37°C for 30min. After washing for 5 times, HRP labelled secondary antibody (50 μL) was added into each well, followed by incubation at 37°C for 30 min. After washing for 5 times, 50 μL colour developer A and 50 μL B were added into each well, followed by incubation at 37°C for 15 min in dark. After that, 50 μL of the stop solution was added to terminate the reaction. With the OD value of blank control set as 0, OD value of each sample was measured at 450 nm using a multi-wavelength microplate reader (Varioskan, Flash; Thermo Scientific, Waltham, MA) within 15 min after the termination of reaction. All data were processed by SPSS19.0 software. Measurement data were expressed as mean ± standard deviation, and the comparisons between groups were performed by independent two-sample t-test. Linear correlation was analysed by Pearson correlation coefficient analysis. p<0.05 was considered to be statistically significant. Abnormal lipid metabolism plays an important role in the development and progression of atherosclerosis. Therefore, serum LDL-C and HDL-C levels of patients in different groups were detected in this study. As shown in Figure 1, level of LDL-C was significantly higher in patients with ICAS than in patients with NCAS (Figure 1A, p<0.01), while level of HDLC was significantly lower in patients with ICAS than in patients with NCAS (Figure 1B, p<0.05). No significant differences were found in levels of LDL-C and HDL-C between ECAS and NCAS groups. Those results suggest that increased LDL-C level and reduced HDL-C level were specific to patients with ICAS. Figure 1: Detection and comparison of serum LDL-C and HDL-C levels in different groups. (A) LDL-C levels in different groups; (B) HDL-C levels in different groups. Notes: *compared with NCAS group, p<0.05; **compared with NCAS group, p<0.01. ApoB, MTTP and SAR1B, which are involved in the formation or secretion of chylomicrons, can affect the level of LDL-C. Therefore, we further detected levels of serum SAR1B, apoB and MTTP in different groups of patients. Results showed that apoB and SAR1B levels were increased significantly in ICAS group compared with NCAS group (p<0.01), while no significant differences were found between ECAS and NCAS groups. There were no significant differences in MTTP level among ICAS, ECAS and NCAS groups. Those results suggest that increased apoB and SAR1B levels were specific to patients with ICAS (Figure 2). Figure 2: Detection and comparison of serum SAR1B, apoB and MTTP levels in different groups. (A) SAR1B levels in different groups; (B) apoB levels in different groups; (C) MTTP levels in different groups. Notes: **compared with NCAS group, p<0.01. Correlation between serum SAR1B and apoB levels and serum LDL-C level in patients with ICAS were analysed. Results showed that serum SAR1B and apoB levels were positively correlated with the level of serum LDL-C (Figures 3A and 3B). Those results indicate that SAR1B and apoB levels can be used to reflect the level of LDL-C and the status of ICAS. 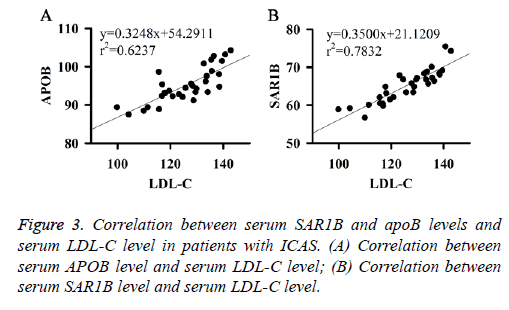 Figure 3: Correlation between serum SAR1B and apoB levels and serum LDL-C level in patients with ICAS. (A) Correlation between serum APOB level and serum LDL-C level; (B) Correlation between serum SAR1B level and serum LDL-C level. The results in this study indicate that SAR1B and apoB can be used as biomarkers for the diagnosis of ICAS. Therefore, the correlations between SAR1B and apoB levels and diagnostic results of ICAS by MRA were analysed. MRA diagnostic score of patients with ICAS was estimated according to a previous study . Results showed that MRA diagnostic score of patients with ICAS was significantly higher than that of patients with NCAS (Figure 4A). Correlation analysis showed that SAR1B and apoB levels were positively correlated with the MRA diagnostic score of patients with ICAS (Figures 4B and 4C). Figure 4: Correlation between SAR1B and apoB levels and diagnostic results of ICAS by MRA. (A) Comparison of MRA diagnostic score between ICAS and NCAS groups; (B) Correlation between apoB level and MRA diagnostic score of patients with ICAS; (C) Correlation between SAR1B level and MRA diagnostic score of patients with ICAS. Notes: **compared with NCAS group, p<0.01. ROC curve analysis (Figure 5) showed that, independent expression levels of SAR1B and apoB, which are consistent diagnostic results of MRA, can be used as biomarkers of ICAS. Figure 5: ROC curve analysis. (A) ApoB; (B) SAR1B. Lipid disorder is a classic risk factor for atherosclerosis . It has been reported that changes in lipid profiles were closely related to the progression of ICAS . Lipoproteins, which are made up of fats and a single layer of phospholipid molecules, are responsible for the transportation of most lipids except free fatty acids. Based on density, lipoproteins can be divided into five groups including chylomicrons, low-density lipoprotein (LDL), VLDL and HDL. Previous studies have shown that HDL can mediate the reverse transportation of cholesterol from arterial wall cells to steroid genic organs and liver, indicating the anti-atherogenic function of HDL . By contrast, other types of lipoproteins, such as LDL, are generally believed to be able to promote the development of atherosclerosis . A recent large scale clinical study carried out in Chinese population have shown that, non-HDLC, which is the composite marker of LDL, is closely related to the progression of ICAS, and elevated level of non-HDLC can significantly increase the risk of the occurrence and development of ICAS . In our study, level of LDL-C was found to be significantly higher in patients with ICAS than in patients with NCAS, while HDL-C level was lower in ICAS patients than in NCAS patients, indicating that LDL-C and HDL-C are involved in the development of ICAS. In addition, no significant differences were found in levels of LDL-C and HDL-C between ECAS group and NCAS group, suggesting that the changes of LDL-C and HDL-C levels are specific for patients with ICAS. ApoB, SAR1B and MTTP play essential roles in lipid transportation and metabolism [11-15]. Therefore, those three factors may also have important roles in the progression of ICAS. Previous studies have shown that the expression of apoB was usually up-regulated in patients with ICAS and the increase in apoB/apoAI can be used to predict ICAS [12,21]. Sar1B, which is a member of SAR1-ADP ribosylation factor family, was also found to be involved in the pathogenesis of atherosclerosis . However, based on our knowledge, the correlation between Sar1B and ICAS has not been reported. MTTP, which is essential for the assembling and secretion of LDL, was found to be able to promote the development of atherosclerosis, and inhibition of MTTP by implitapide can significantly slow down the development of atherosclerosis in apolipoprotein E knockout mice . However, the specific role of MTTP in the pathogenesis of ICAS is still unknown. In our study, apoB and SAR1B levels were increased significantly in ICAS patients but not in NCAS patients, indicating that the levels of apoB and SAR1B were specifically positively correlated with the occurrence of ICAS. After detecting the levels of MTTP, no significant differences were found between groups, suggesting that MTTP may not be essential for the development of ICAS. ApoB is a major component of LDL and SAR1B is important for the formation and secretion of chylomicrons [11,15]. In our study, apoB and SAR1B levels were found to be positively correlated with the level of serum LDL-C, indicating that apoB and SAR1B can reflect the level of LDL-C in serum, which can be used to evaluate the status of ICAS. The prevention and treatment of ICAS and ICAS induced stroke is hindered by the unclear pathogenesis . So, the early diagnosis of ICAS is the key for the treatment. Previous studies have shown that biomarkers of inflammation including PAI-1 and hsCRP were correlated with the stroke caused by ICAS. In addition, reduced number of circulating progenitor cells is also found to be associated with the increased risk of recurrent stroke in patients with ICAS . However, individual differences hindered the popularization of those biomarkers in clinical practice. In our study, apoB and SAR1B levels were found to be specifically increased in ICAS patients but not in other patients, indicating the potential role of ApoB and SAR1B in predicting ICAS. 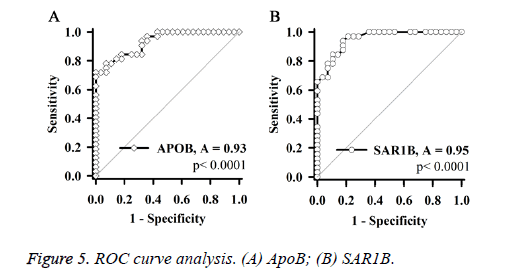 Were further test the accuracy of apoB and SAR1B as biomarkers for the diagnosis, the results showed that expression levels of SAR1B and APOB were consistent diagnostic results of MRA, indicating that ApoB and SAR1B levels can be used to accurately predict ICAS. We also compared the distribution of age, gender, blood pressure, and blood glucose, and a variety of physiological and biochemical index, but no significant differences were found in-between groups, indicating that those factors cannot be used as specific biomarkers from ICAS. In conclusion, compared with the patients with ECAS and NCAS, expression levels of SAR1B and APOB were specifically increased in patients with ICAS. Serum SAR1B and APOB levels were positively correlated with serum LDLC level and MRA diagnostic score of patients with ICAS. In addition, Serum SAR1B and APOB levels can be used to sensitively and specifically reflect ICAS. Therefore, the changes in the levels of serum SAR1B and APOB can be used as biomarkers in the diagnosis of ICAS. We thank the financial reports from Shenzhen Project of Science and Technology (grant no. JCYJ20140415162338844, JCYJ20130402114317402, JCY20150605103420338). Hansson GK, Hermansson A. The immune system in atherosclerosis. Nat Immunol 2011; 12: 204-212. Kim JS, Bonovich D. Research on intracranial atherosclerosis from the East and west: why are the results different? J Stroke 2014; 16: 105-113. Gorelick PB, Wong KS, Bae HJ. Large artery intracranial occlusive disease. Stroke 2008; 39: 2396-2399. Yarchoan M, Xie S X, Kling M A. Cerebrovascular atherosclerosis correlates with Alzheimer pathology in neurodegenerative dementias. Brain 2012; 135: 3749-3756. Turan TN, LeMatty T, Martin R. Characterization of intracranial atherosclerotic stenosis using high?resolution MRI study-rationale and design. Brain Behav 2015; 5. Frankel MR, Quyyumi A, Zhao Y. Abstract T MP33: Biomarkers of ischemic outcomes in symptomatic intracranial stenosis (biosis)-preliminary results. 2014. Shen J, Geng X, Stevenson J. Fat, diet and intracranial atherosclerosis. Environ Dis 2016; 1: 90. Orekhov AN, Bobryshev YV, Sobenin IA. Modified low density lipoprotein and lipoprotein-containing circulating immune complexes as diagnostic and prognostic biomarkers of atherosclerosis and type 1 diabetes macrovascular disease. Int J Mol Sci 2014; 15: 12807-12841. Vega GL, Barlow CE, Grundy SM. Triglyceride-to-high-density-lipoprotein-cholesterol ratio is an index of heart disease mortality and of incidence of type 2 diabetes mellitus in men. J Invest Med 2014; 62: 345-349. Li X, Wang A, Wang J. Association between high-density-lipoprotein-cholesterol levels and the prevalence of asymptomatic intracranial arterial stenosis. Sci Rep 2017; 7: 1. Sun H, Samarghandi A, Zhang N. Proprotein convertase subtilisin/kexin type 9 interacts with apolipoprotein B and prevents its intracellular degradation, irrespective of the low-density lipoprotein receptor. Arterioscler Thromb Vas Biol 2012; 32: 1585-1595. Park JH, Hong KS, Lee EJ. High levels of apolipoprotein B/AI ratio are associated with intracranial atherosclerotic stenosis. Stroke 2011; 42: 3040-3046. Choi SH, Ginsberg HN. Increased very low density lipoprotein (VLDL) secretion, hepatic steatosis, and insulin resistance. Trends Endocrinol Metab 2011; 22: 353-363. Sahebkar A, Watts GF. New LDL-cholesterol lowering therapies: pharmacology, clinical trials, and relevance to acute coronary syndromes. Clin Therap 2013; 35: 1082-1098. Karpe F, Taskinen MR, Nieminen MS. Remnant-like lipoprotein particle cholesterol concentration and progression of coronary and vein-graft atherosclerosis in response to gemfibrozil treatment. Atheroscler 2001; 157: 181-187. Lee EJ, Choi KH, Ryu JS. Stroke risk after coronary artery bypass graft surgery and extent of cerebral artery atherosclerosis. J Am College Cardiol 2011; 57: 1811-1818. Bang OY. Intracranial atherosclerosis: current understanding and perspectives. J Stroke 2014; 16: 27-35. Kim DE, Kim JY, Jeong SW. Association between changes in lipid profiles and progression of symptomatic intracranial atherosclerotic stenosis. Stroke 2012; 43: 1824-1830. Von EA, Nofer JR, Assmann G. High density lipoproteins and arteriosclerosis. Arterioscler Thromb Vas Biol 2001; 21: 13-27. Wu J, Wang A, Li X. Non-high-density lipoprotein cholesterol levels on the risk of asymptomatic intracranial arterial stenosis: a result from the apac study. Sci Rep 2016; 6. Park JH, Hong KS, Lee J. Deep subcortical infarct burden in relation to apolipoprotein B/AI ratio in patients with intracranial atherosclerotic stenosis. Eur J Neurol 2013; 20: 671-680. El-Sayyad HIH. Cellular cholesterol retention in atherosclerosis[M]//Handbook of cholesterol. Wageningen Acad Pub 2016; 23-38. Ueshima K, Akihisa-UH, Nagayoshi A. Implitapide, a microsomal triglyceride transfer protein inhibitor, reduces progression of atherosclerosis in apolipoprotein E knockout mice fed a Western-type diet: involvement of the inhibition of postprandial triglyceride elevation. Biol Pharm Bulletin 2005; 28: 247-252.